I used to hate when someone would say just live in the house, see how you use it. I think I just really didn't like the idea of living in what I saw as an unfinished house. But, through the process of this renovation, and being forced to live in a house that was less than finished in the early days has really changed my ideas on this concept. I'm finding that all of those decorative pieces, extra pillows, pieces of art, etc that I'm now have a difficult time finding a place for, were probably pieces I bought just to get a place decorated, not things I truly loved, or lived with. 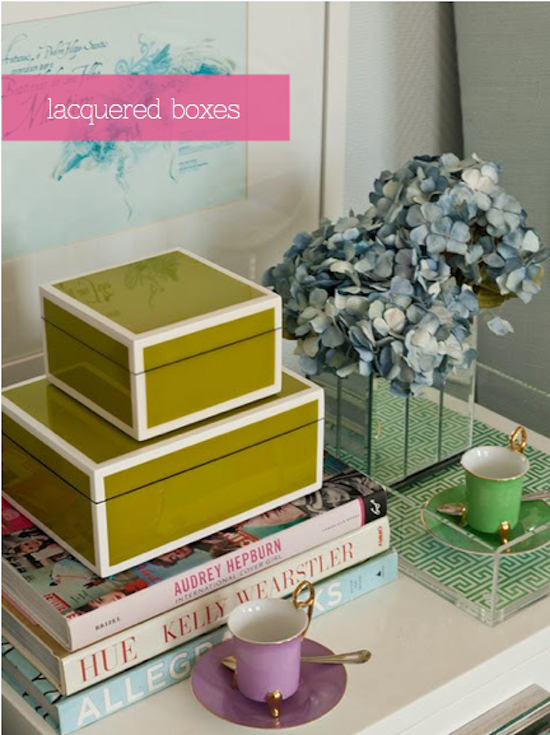 I loooovvveee these lacquer boxes. Perfect for adding a little bit of polish to any tablescape. The bedrooms are shaping up to be super cozy, which is exactly what I wanted. But- more pillows are definitely needed. The CWD pillows above add a little color and design without being over the top, and keep in line with the monochromatic color palettes in the rooms. Its no secret that I've wanted to add an oversized beach print to my home for a long time, see here, but the Thom Filicia blurred prints have always stuck in my mind. The fact that they are lacking a certain bluntness that beach prints often give is calming and attractive. I live in Minnesota, I've got plenty of faux fur throws laying around, and despite the near 40 degree temps today, I still chose this picture - but the fact of the matter is, I think we need a couple more throws at home. The Serena and Lily herringbone throws pictured above are perfect for any time of year, and still achieve adding a little dimension and extra comfort to a space. Ohhhh I love all your inspiration pictures. I agree that it is hard to live in a space without it being finished. I always want to rush ahead and get it all decorated and THEN live in the space. But you are right- taking time really makes a much more desirable end result. 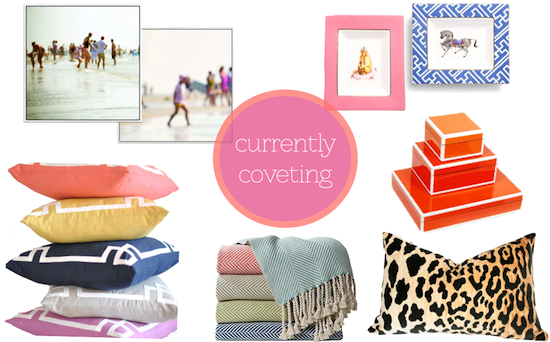 I am in love with those beach prints and the leopard pillow! It is so hard to sit in an unfinished house. I agree on living in a space. I see things I bought just to "fill" a space and I wish I would have waited. Keely thanks so much for including my leopard pillow in your list! Love all your picks! I will keep this in mind! I am moving this summer! I want those boxes! I can so relate! We lived in our "new" home for almost three years and it's about half finished. It makes me anxious (and less fun to have people over) but I agree that it's better than buying a bunch of crap just to fill the space. Plus I change my mind so often, it will never really be finished anyway!